Swiss television has published on its website an interview with Lucy Riina, daughter of mafia boss Toto Riina, who said ‘I am proud and happy to call me Riina. It ‘s the name of my father and I imagine that any child who loves his parents does not change his family name. It corresponds to my identity ‘. ‘Our mother was extremely important, because we could not go to school. She taught us to read and write’. ‘ They’re my parents, we are Catholic and I love my father and my mother’, pointing out that every night they prayed for the boss and that the worst in his life was the arrest of his father. So ‘worst’ that every year, for about twenty years, millions of Italians rejoice the day of his arrest and commemorate massacres and martyrs of the Mafia. 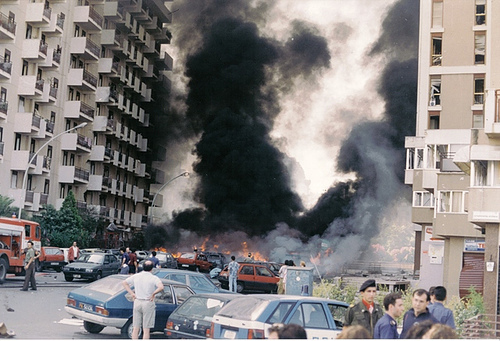 Almost immediately the reaction of the Italian civil society, like that of Giovanna Maggiani Chelli, president of the Victims of the Massacre of Via dei Georgofili Association: ‘His father did not kill someone in a fit, but he slaughtered and butchered scientifically made hundreds of poor souls who have found themselves even just on its way as our children. Lucia Riina appalled a good time in front of so much innocent blood spilled ‘cause those like her could have a rich life’. Toto Riina was the undisputed head of the Sicilian Cosa Nostra for about twenty years and he ordered hundreds of deaths and injuries, attacks and car bombs, massacres, conspiracies and corruptions, that will shape the future of Italy and the Mediterranean for many decades to come. We cannot forget that Cosa Nostra (and later Ndrangheta) invaded Italy and (in part)Germany with heroine poisoning generations and generations, creating a parallel tax system named extortion, putting tentacles – more or less directly – in many contracts and concessions, going so far as the London Stock Exchange after that of Milan. A man responsible for the death of judges Falcone and Borsellino with their security staffs. A criminal in career who has castrated the aspirations for growth and development of his own land, Sicily, affecting even the water supply to homes and fields, as still happens. He affected the election results of the Region and the Parliament. He blackmailed and probably continues to blackmail the Italian State, one of the countries of the G8 and NATO. He has implemented terrorist attacks against civilians with car bombs and heavy charges. How she can be ‘honored’ by a ‘this kind’ parent is hard to understand, unless we speak of ‘men of honor’ and ‘honored society’, but it is even more difficult to understand how she could be grateful to a father that – to escape the prison and continue its sordid business – has made raising children in hiding without even being able to attend a school and find freely their friends. A Mafia boss who has never shown signs of repentance, as it happened for the bosses Provenzano and Buscetta or the killer Brusca. ‘The daughter of a mobster, what we expect’ someone would say, forgetting that consciousness is something individual and not inherited from the parents, which at most can educate or plagiarize. A consciousness of which Lucia Riina clarifies the moral reference when she says “we are Catholics and I love my father and my mother.” A matter of conscience regarding all Catholics, if, for example, in Mexico there is a long-standing controversy for those rich donations that the Catholic Church accepts the Narcos. In fact, the Radio Télévision Suisse types on site a title like “Une éducation catholique”. Still, we should remember – including Mexicans – that Sicilian episcopate imposed the penalty of excommunication from the mafia for three times – in 1944, 1955 and 1982 – and that Pope Wojtyla, lifting his finger to the Sky launched the anathema ‘Repent!’ against the mafias, called “fruit of the work of the tempter,” “social sin”, the “opposite” of ‘love civilization willed by God. Even on last May 20th, Francis Pope reiterated that ‘funeral can not be celebrated in the church for the Mafia people, because, by not accepting the Gospel message, they rank directly outside. The author Roberto Saviano – under fatwa by Casalesi because he wrote the book Gomorra, has recently urged the Pope to issue an excommunication Urbis et orbis, to offenders as to part of the clergy – who officiates the sacraments – because they continue to ignore the ‘lata sententia’. Without resorting to the very busy Vicar of Christ, it would be very appropriate and useful that someone informs Lucia Riina of what ‘god of the Underworld’ servants will do the mobsters like his father and what it provides Catholicism for families like hers, if at first repentance and shame do not replace honor. No mafia or supporter of any mafia can be called Catholic. Stop.